This year, one of the most exciting news for PS4 Pro owners is that Sony’s update for PS4 Pro media player with the ability to playback 4K video from external storage device or home server. Have a lot of personal 4K video shot with your camera or smartphone or downloaded from online 4K streaming sites and wish to load them all to PS4 Pro? Don’t be happy to early. The bad news is that the supported 4K content by PS4 Pro media player are limited to MP4 container format that are encoded with H.264/MPEG-4 AVC codec. It also means that you can’t play 4K video on PS4 Pro with other popular container file formats such as MKV, MOV or compression codec like H.265, Prores, etc. The following article will show you how to get any 4K video viewed on PS4 Pro from USB or home server. It’s very likely that the 4K video you try to enjoy on PS4 Pro will be other unsupported container file formats such as AVI/WMV/MOV/TS/MXF/XAVC/XAVC S or incompatible compression codec such as H.265, Prores. To fix all those container formats or codec incompatible issue, the most direct way is to perform a conversion process. Here, you can get the job easily done with our simple to use yet powerful 4K Video Converter - Pavtube Video Converter. It has full support for all the 4K container file formats and compression codec listed above. Besides that, the batch conversion mode also assists you to load multiple unsupported 4K video for conversion at one time to save your precious time. With just few clicks, you can easily rewrap and transcode unsupported 4K to PS4 Pro media player readable 4K H.264 MP4 files with fast conversion speed and remarkable file quality. The program supports hard-ware acceleration encoding, you can get up to 6x faster H.264 codec encoding as long as you run your computer on Graphic cards that supports Nvidia CUDA or AMD App technology. The program is available on both Windows and Mac platform, for Mac users, you can download Pavtube Video Converter for Mac to perform the conversion on macOS High Sierra, macOS Sierra, Mac OS X El Capitan, Mac OS X Yosemite, Mac OS X Mavericks. – USB storage that’s already been formatted as extended storage for your PS4 can only be used to save games and apps – it can’t be used to save and play the videos. Step 2: Output PS4 Pro supported 4K file formats. 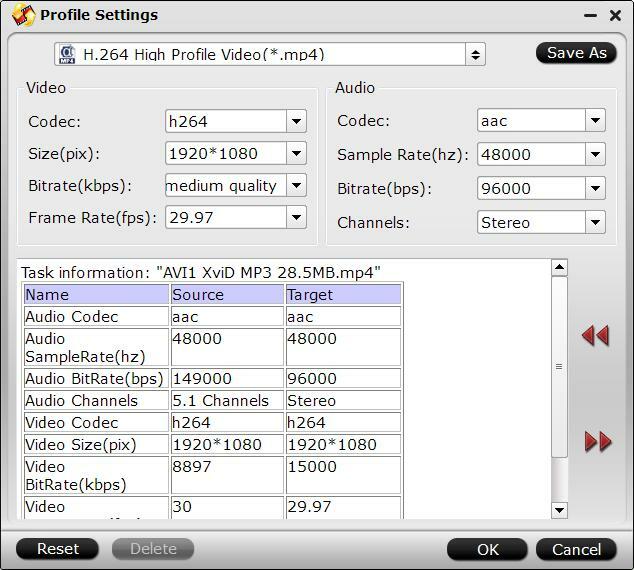 Click “Format”, from its drop-down option, choose PS4 supported MP4 video codec from “Common Video” > “H.264 High Profile Video(*.mp4)” to output. Tips: You can adjust output profile parameters such as video codec, bit rate, frame rate, resolution and audio codec, bit rate, sample rate and channels to get the best playback settings for PS4 Pro in the program’s “Profile Settings” window. Go back to the main interface, click right-bottom “Convert” button to begin the conversion from 4K video to PS4 Pro supported file formats conversion process. When the conversion is completed, click “Open Output Folder” to pop out the folder with converted files, then you can easily transfer and play converted files on PS4 Pro via an external USB drive. Playing MKV movies on PS4 Pro? Can PS4 Play 4K Videos or Downscale to 1080p? How to Convert Videos to MP4 for PSP Playing ?